Unfortunately, while fiscally rational decisions have been good enough to get Microsoft to where it is today, such decisions have never and will never catapult a company into the top of the future. It’s the difference between a CEO who is good enough and one who is better. Ballmer, I think, is firmly in the good enough camp. He might even be slightly better, because we should not forget this very consistently true fact: Microsoft makes around $5.5 billion every three months. In pure profit. Don’t we all want a CEO that we can define as “good enough, maybe better”? Curtis is right, Microsoft is profitable, but there’s another factor to success: value. After all a CEOs primary directive is to increase stakeholder value. 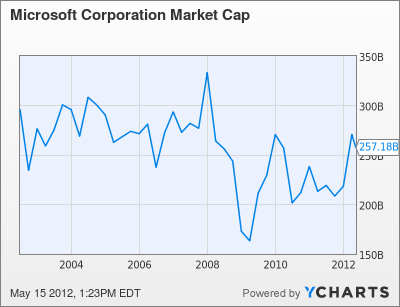 Let’s measure value by market cap, and the earliest market cap data I can find is from 6/30/2002, well after Ballmer took Microsoft’s reigns. At that time Microsoft had a market cap of $296.23 billion, as of this writing Microsoft has a market cap of $257.18 billion. A loss in market cap value of $39.05 billon, Billion. No matter what Microsoft nets quarterly, the company is still worth less today than it was when Ballmer took control. What this shows is that Microsoft’s market cap is highest at the beginning of the year, declining towards the end — it’s been doing this since 2008. So I think it’s safe to assume that by years end Microsoft will be worth far less than it is today (even if you average the market cap over the course of the year). No matter how you look at it, Microsoft is not worth what it was when Ballmer took control. It doesn’t matter how well Ballmer does on a quarterly basis, because the aggregate shows the truth. Ballmer needs to go. And, again, I own stock in Microsoft.